All general purpose implementation have constructors that take a Collection object. IMPORTANT when you need to iterate and modify the collection at the same time Iterator is the only way to do it without triggering any undefined behavior . For instance, imagine if you need to remove elements greater than 5 from a Collection of Integers. Since Java 8 all Collections provides support for streams . A stream is simply a sequence of elements. Stream’s element are not stored anywhere (a stream is not a data structure). Think about them as flux of data on which you can perform a number of pipelined operations. For instance here is how to write the filter we have seen before using streams. This shows how to pipeline multiple operations. Note that filter-map is a very common pattern! Whenever possible use streams because they end up in better code quality and ofter in increased performance because of the capability of parallel processing of streams. reduce is a very powerful patter. It Allows to reduce a Collection to a another type using a binary operation . Set is a Collection that cannot contain duplicate elements. It models the mathematical set abstraction. The Set interface contains only methods inherited from Collection and adds the restriction that duplicate elements are prohibited. Set also adds a stronger contract on the behavior of the equals and hashCode operations, allowing Set instances to be compared meaningfully even if their implementation types differ. Two Set instances are equal if they contain the same elements. Java provides three implementations of Sets. Besides basic Collection operations, queues provide additional insertion, removal, and inspection operations. A common Queue variant is the PriorityQueue which removes elements in a sorted manner. Elements with higher priority first. As an example, we will show how to sort a Collection of Integers. Note that this sorting method has a name and is called heap sort . When the priority queue is implemented using a log(n) access data structure heap sort has optimal complexity nlog(n) . A Map is an object that maps keys to values. A map cannot contain duplicate keys: Each key can map to at most one value. It models the mathematical function abstraction. The Map interface includes methods for basic operations (such as put, get, remove, containsKey, containsValue, size, and empty), bulk operations (such as putAll and clear), and collection views (such as keySet, entrySet, and values). Stream in Java brings functional programming into Java. Functional programming is different from imperative programming. For those interested in Functional Programming I suggest to read more about Haskell (which is one of the most popular FP languages out there). For a computer science it is mandatory to know more about this. Functional programming is heavily based on a pretty abstract and new branch of mathematics named category theory . One of the concept in this theory is the Monad . A Monad represents a computation a series of steps and the semantic of chaining operations that operate on the monad itself together. You don’t need any knowledge of category theory at all to put java streams in full use. Streams can be created from Collections easily using the stream() method exposed by the Collection interface. The stream can be also created from regular objects using the static method from Stream . 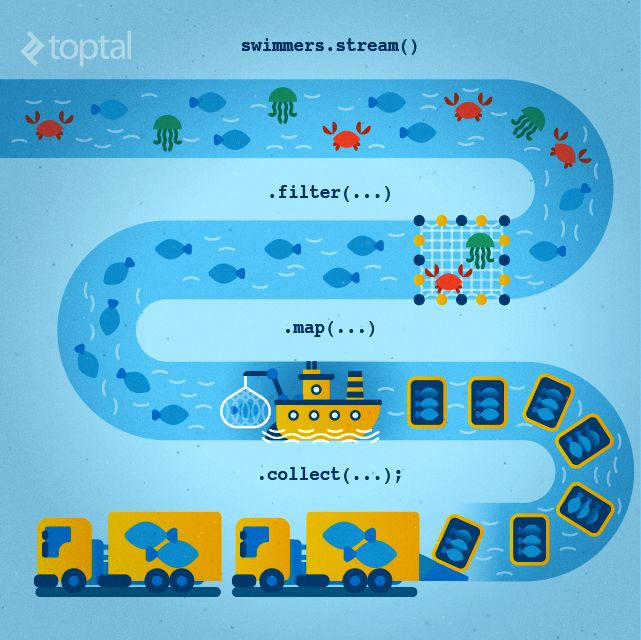 Stream is a stream of Object (java class Object ) but there are many specializations of stream for different types. IntStream for instance is a stream made for working with integers. Specialized streams works as normal stream but they also expose specialized methods ( IntStream provides sum() for instance). It means that any stream operations is really performed only when the result of the operation is required. When executed this code does not print anything at all on the console simply because the stream is never required to be printed on the console! This mean also that filtering operation does not really take place at all unless some of the values of the stream are used at later time in the program. Elements are processed vertically. It means that a single element is completely processed before moving to the next one. Elements from 1 to 99 are not processed at all! Some operations can’t process element without processing the others! Think about sorting for instance. You can’t sort a stream without looking at all elements of the stream. For that kind of operation, the order of execution is horizontal. One you create a stream any attempt in reusing it will raise an exception! IllegalStateException . stream.noneMatch(s -> true);   // exception. 2nd use! In order to avoid setting up the same stream more than once you can use a Supplier<Stream> . It exposes a get() function which creates a brand new stream (and already setted up) for use.